Welcome! Located in Marana, just outside of Tucson, Arizona, this established Park has many returning visitors, as well as new faces throughout the year. Our goal at Valley of the Sun, is to make your stay in the area, a pleasant and memorable one. 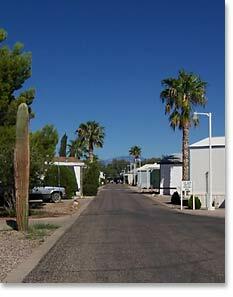 Pull-through spaces are available, with a total of 70 RV spaces – There are also 50 permanent mobile home sites. Renovations and updates are constantly being done to the park, and the area around the clubhouse and pool. Bathrooms were recently completely renovated with modern tiling. The large Recreation room has been updated and overhauled as well. There is a Laundromat and poker/pool table room for the guests use. We have a variety of activities for our residents to enjoy and we are located conveniently outside of downtown Tucson in a quiet, rural, and growing area. There are lots of tourist attractions nearby, in addition to golf courses, casinos, restaurants and more. We are sure you will find the people in this park are friendly and helpful. The management team will do everything we can to make your stay with us a great one. 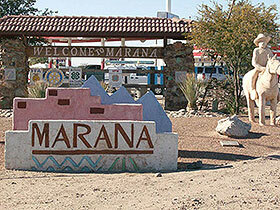 It is our goal to see that you have a great stay, and enjoy all the beauty of Arizona and the Marana/Tucson area. We hope you will look forward to coming back year after year, as many of our current residents do.